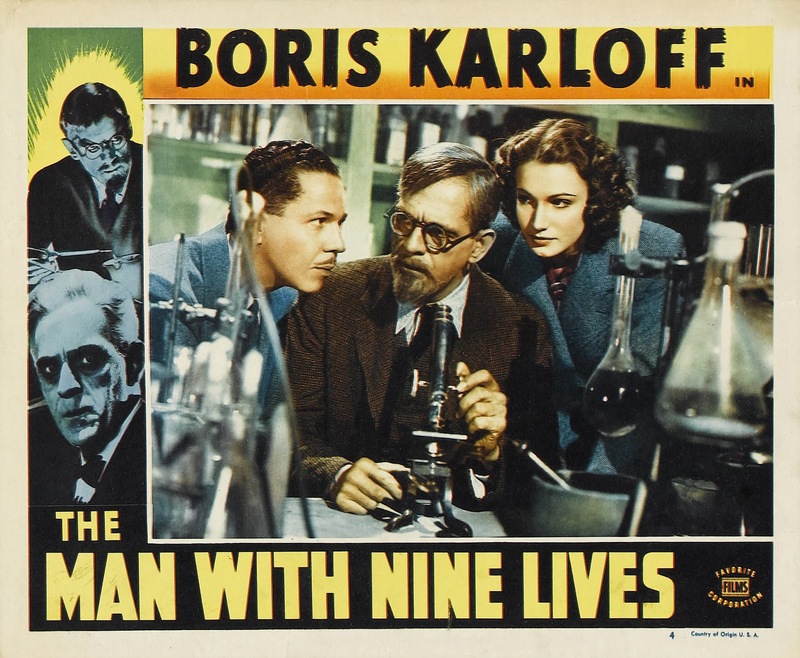 Boris Karloff went straight from his dangerously single-minded man of science in Black Friday into another similarly driven scientist in The Man with Nine Lives (1940) for Columbia Pictures, re-teaming with Nick Grinde who directed him in 1939’s The Man They Could Not Hang (see my review 25/10/2016) from a script by Harold Shumate. 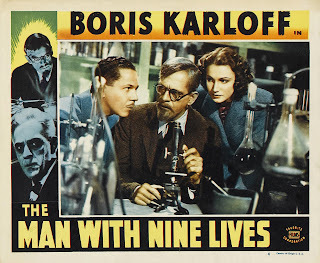 The same real-life story inspired both films as well as Life Returns in 1935 (also fully reviewed by me on 5/7/16), that of Dr Robert Cornish’s successful experiment in reviving the dead – a dog in his case – to feverish criticism by moralists. 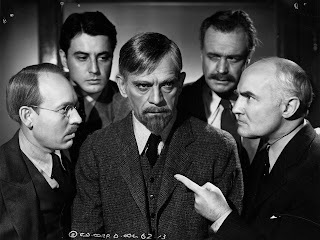 Karloff plays Dr Leon Kravaal, perpetuating a fond predilection for foreign names for that extra touch of the gothically sinister – (giving your horror movie M.D. a name like Jim Baxter doesn’t quite work somehow). His part’s reputation and enigma precedes him in this film as we first spectate on another doctor’s pioneering operation using ‘frozen therapy’, a forerunner to cryogenic suspension. Dr Tim Mason (an earnest Roger Pryor, also from the earlier film) is attempting to freeze a cancer patient on the operating table in the hope that, once rejuvenated, she will be clear of tissue damage. The procedure is an amusingly low-tech method consisting of applying two tubes to the patient and a mound of ice-cubes dumped on her chest, followed by pouring hot coffee down a rubber pipe into her by way of revival. No wonder his employers are concerned – this is the work of a graduate from Garden Shed School of Medicine. Mason’s well-meaning enthusiasm over-states his claims for a cure, resulting in the faucet of funding for his research being abruptly turned off. His nurse fiancé Judith, the beguiling beauty Jo Ann Sayers, commiserates and encourages him to seek out the man whose book was his inspiration. The reclusive Dr Kravaal has been living in the mountains near the Canadian border and hasn’t been seen for years. The couple decide to travel to find him in order to further this incredible technology. A boat-ride deposits them at the dilapidated, cobwebbed house of Kravaal wherein even the laboratory appears unused for a long time. The dry-rotted floorboards create a hole that reveals a tunnel leading to a virtual ice tomb containing the frozen body of Kravaal and four other men. 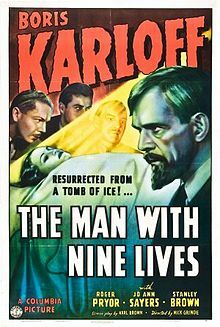 Mason and Judith set about thawing him out by a fire, and here Karloff convinces well as a man whose mind gradually defrosts into the astounding realisation that he has been encased in suspended animation for an entire decade. Beneath a distinguished dark hair-piece and goatee, his characterisation and point-of-view mapped out by the script is the saving note of interest in an otherwise run-of-the-mill plot. Predictably, yes we discover that like all scientists in pursuit of great breakthroughs, the eminent doctor is willing to sacrifice a few human lives. However, we are never allowed to regard him as a raving immoral monster. The script never loses sight of continually weighing the apparent cruelty of Kravaal’s actions against the long-term needs not just of society but of the terminal individual he is treating, who crucially has nothing to lose. His back-story positions this argument for both sides in flash-backs depicting him having frozen a wealthy consenting patient, Jasper Adams, and being forced to explain his ongoing secrecy to the man’s nephew Bob, (an awkward Stanley Brown), the district attorney, coroner and police sheriff. They demand he must stop and release the man. He in turn pleads passionately that he must continue in private to avoid a break in the treatment that would be fatal to Adams. This balancing act of Kravaal’s morality prevents us from losing sympathy for him at several points in the film. It emerges that having no choice but to take the four men to his home, Kravaal entombs them in a chamber to protect his experiments. Upon thawing by the young couple, the third act turns into a reasonably tense siege drama of mistrust and self-preservation amongst the group as they are pitted against the ‘necessary’ cunning of Kravaal. Bob Adams is shot by him after the young man burns his formula. This causes the doctor to hold them all prisoner while he struggles to replicate his research from scratch, arguing with some justification that it is their fault and that he was coerced to bring them here in the first place.